So, we’re still scrolling through my life here and we’re still in Cozumel, Mexico on our honeymoon. 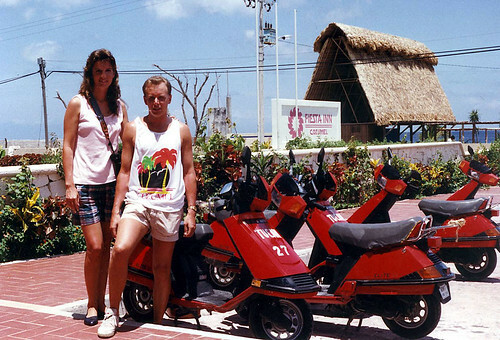 This is me and Kevin, standing next to the scooter that we rented. I was pretty nervous about riding around on a scooter, in a foreign country, but what else is new? I was nervous that whole trip. I was apprehensive (naturally), but Kevin talked me into it and we did indeed spend an entire day exploring the 30-mile long island. It was incredible. And beautiful. And we had a great time — just us and nature. But they ruin the idyllic picture so … meh. And take a gander at Kevin’s muscles – RAWR.